I'm slightly obsessed with products that help the environment or promote green living, and I thought I'd throw together a post of some of the items I have tested myself and love dearly. Just in case you're looking for the perfect gift for your granola cousin your eco-friendly cousin. 1. Dryer Balls. Find them at Target for under $5 for a set of two. As an added bonus, they are the right size to be used as a stocking stuffer. And they last for ages. Mine actually help my clothes get dried about 15 minutes more quickly than if I don't use them - and saving energy makes me happy! 2. Envirosax. 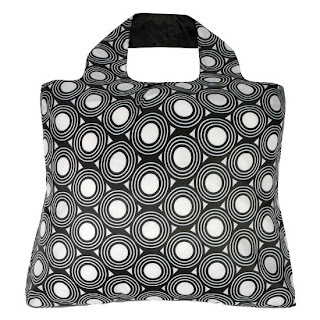 These reusable shopping bags roll up into tiny sacs, easy to slip into a purse. 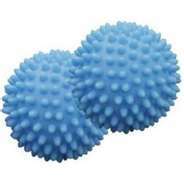 They are incredibly durable, holding up to 40 pounds, and come in such fun, trendy designs. I have the Animal Planet set of 5, but you can find a design for just about anyone. I always get comments from the cashiers on how cute they are. $5.99 and up. 3. Mesh produce bags by Flip and Tumble. Yet another way to cut down on the overuse of plastics in our world. Light and easy to use, just toss them in the wash after shopping. $10.95 for a set of 5. 4. Cloth diapers by Fuzzibunz. Because babies can be green too! Fuzzibunz are the best cloth diaper I've ever known and loved - the twins have been in them for almost a year and a half now, and they are still holding strong. One diaper will run you about $19.99. 5. 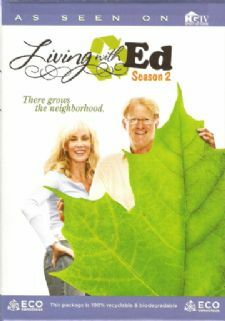 Living with Ed, Seasons 1 and 2, on DVD. A lighthearted, humorous tv series on living green to the extreme? Yes please! Prices range from $7 - $22.50 each. 6. Drying rack. You can pick these up at Target for around $13 and skip that energy-sucking clothes dryer all together! They fold up conveniently - I've got mine stashed to the side of my dresser where no one can see it when it's not in use. 7. A Trader Joe's gift card. Because you can't go wrong with gift cards and - let's face it - you can't go wrong with Trader Joe's. (Dear Trader Joe's: All I want for Christmas is for you to build a store in Roanoke, Virginia). 8. 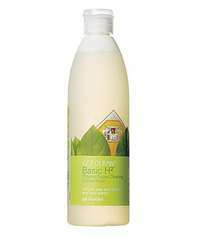 Shaklee Basic H2 cleaning product. A little goes a long way, and a bottle will last for ages! Plus, you can use it on anything, and it doesn't have a bunch of nasty chemicals. You'll also be supporting a really awesome business that is running a 'net-zero impact on the environment' company. 9. Patagonia is another company that works hard to reduce the global environmental footprint. Not only that, but they make high quality gear for anyone that loves the outdoors - and for all ages too! 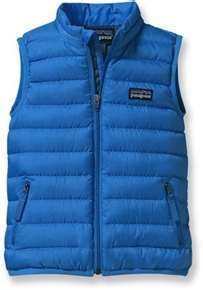 The boys were handed down little puffy Patagonia vests as infants and we loved them so dearly! Retail around $70. 10. Reusable lunch containers. There are so many fun choices out there - and anything that cuts down on plastic sandwich baggies is a win-win situation. One of our current favorites is the Fit & Fresh Kid's Little Dipper. It has a section to go in the freezer to keep cold before assembly, and then a little compartment to put dips in. It's also BPA free. Pierce especially loves to take it to school stuffed with apples and peanut butter for dipping. $10 for a set of 4. There you have it! Some of my favorite green products, just perfect for your environmentally friendly friends and relatives. You know what would be even better though? Win some wonderful green products right now, in my Eco Natural Soaps giveaway! You can go enter here! Disclaimer - I wasn't provided anything for this gift guide - it's just a list of things around the house that we know and love. Also, the images were snagged from Google. im going to show this list to my wife I neve dr. heard of the dryer balls ! have a great day. This is a wonderful list! The Little Dipper looks like a great way to keep things cool! I hope you get a Trader Joe's. There are several on there that I would like to have in my stocking! Wonderful post to help us all with our 'green' endeavors. Thank you and thanks also for stopping by my blog. Do you sell Shaklee? I love their Basic I product - it gets out everything. I use 1 - the balls - 2 the bags - 6 the clothes rack - and I love number 8 - Trader Joes! 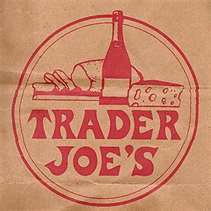 Roanoke will probably be the last city on this planet that Trader Joes comes to... nobody likes us... sniff sniff.. I actually have (and use) most of these things! Plus we are getting a Trader Joes soon in Cville!! Even tho it's not Roanoke, it's a whole lot closer than Richmond for you! I'm going to have to check out the mesh produce bags. It burns me up every time I grab a plastic bag to put the produce in that I'm purchasing. These would be great! I'm all about green~! Thanks for all the ideas...In cleaning your windows I have found that vinegar and water are the best. no streaks when you use this together.. I was raised with my Mom and watching my gramma save all the wax paper bags that was in cereal, reuse tin foil, make your own butter, the list is endless so I'll just mention these..
We need to get back to green.. I have never heard of the dryer balls, I might have to try them. I didn't know the dryer balls made the clothes dry faster- I just thought they were a fabric softener replacement! i need to get those dryer balls. thanks for the tips! I was going to say: What an awesome post when I noticed that Nancy already used that awesome adjective. Oh, well it is true, thank you so much. I have some bags I get for free at my diabetes support group, advertising all kinds of diabetes stuff, but they are great. And I do dry my clothes on the line since my dryer is gas and we only have electric here. It is my favorite chore, so peaceful to be out there hanging clothes. Yes, Trader Joe's, would you please come to Tehachapi too! Please! What tickles me is that I have almost all of those things you list--and i made a bundle of wool dryer balls 2 years ago to give people. They are such a great gift. Great products Lisa! Those dryer balls are pretty cool! I love my dryer balls!!! I was getting worried because I couldn't find them but I'm glad to know that Target has them!!! Thanks for this post!!! Ohhh! I would love to have the Envirosax & mesh produce bags...thanks for the tips! I LOVE this!! Where do you get the Envirosax, I want them!!! Are they in stores, or on line? 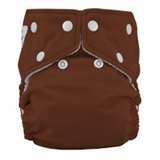 $20.00 for one diaper, you must have made a typing mistake...we watched this Ed Begley show, and really love it!! It was informative, and really funny, too! We have been to the Trader Joe's in Short Pump, but it is kind of small. They are building one in Charlottesville, yes!!! We go there all the time and it's only a half hour away! P.S. I didn't know about dryer balls, thanks for the tip, I think I will get them, as well. Don't forget to let me know where i can get the Envirosacks. It is so hard to get a decent shopping bag anymore when you are doing serious shopping! Thanks Lisa for the great list. 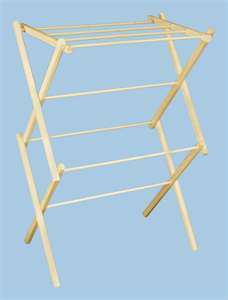 I have used a dryer rack for years ---and we don't use our dryer except for sheets and other big linens. Great idea's! I need to try those dryer balls especially since it cuts down on drying time. I am going to have to grab some dryer balls and give them a try...and you're right, great presents, too...when we lived in England I learned to carry my own shopping bags since they weren'treally offered, so have some really cute ones that came to the State with me. Really liked this post, very informative! I couldn't get by without my drying rack, and I love my Envirosax bags too! Great list! 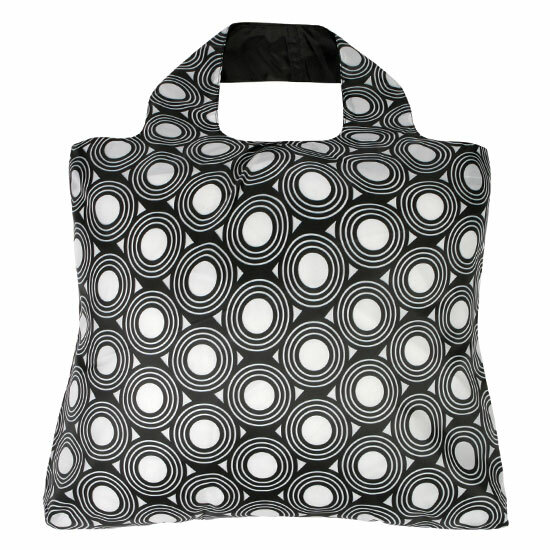 I've sewed some bags for myself that I take grocery shopping but those Envirosax are super cute. And I LOVE those wood drying racks. I hang most of our clothes outside to line dry but when I can't, I use those racks. I bought mine up in Amish country so it looks like it is on steroids. It is about 6' tall hahah. That snack/dip container rocks! I've been looking for one like that forever! I could never find one with the dip being seperate. I love it! I am obsessed with reusable shopping bags and Trader Joe's! The lunch box is too cute...perfect for my son. Thanks for the tips, Lisa. I'm especially interested in the dryer balls. I could use a drying rack, but it would have to be out in the open for all to see. I don't get much company here so I could probably use one after all. Great list! I love Trader Joes! All my grocery shopping is done there! Great ideas! 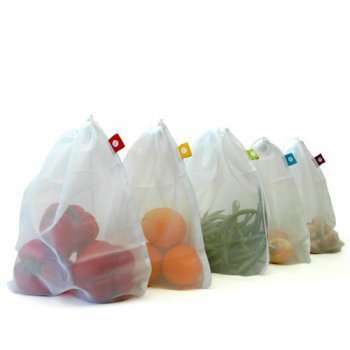 I should get some of those mesh produce bags! Fun products!!! We have those dryer balls, though my kids always steal them so I need to get more! And I love the dipping containers--my kids would love those!